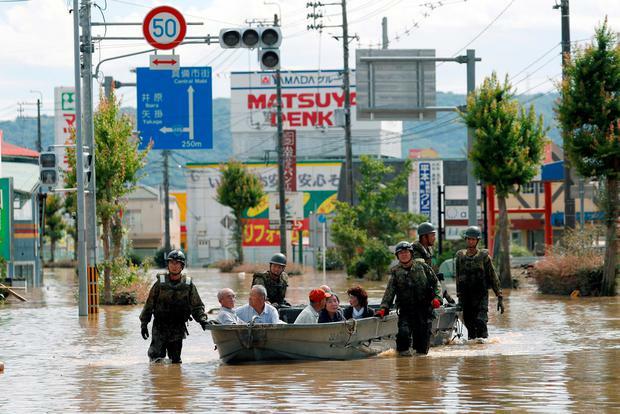 Japan has been hit by the worst flood disaster since 1983, around 13,000 people are left without electricity, causing widespread damages to home and businesses. A team of rescuers are searching for nearly 80 people in some of the hardest-hit Hiroshima area. Now the death toll has reached about 110 after floodwaters forced several million from their homes and another 79 went missing. Officials warned of sudden showers and thunderstorms even though continuous rain ended. There were further risk of landslides on steep mountainsides that saturated over the weekend. Most of the homes got smashed and others were left in a tilting position, rivers overflowed flooding towns and turned them into lakes. Dozens of people were stranded in the rooftops, while military paddle boats and helicopters were used to bring people to dry land. According to the Japan Meteorological Agency there were three hours of rainfall in an area in Kochi prefecture. It reached an accumulated 26.3 centimetres (10.4 inches) which was the highest since 1976. There was an emergency task force set up by the government over the weekend. Troops, firefighters, policies and other disaster relief. The natives took to social media for help. From the weekend evacuation orders were scaled back and two million people were still facing orders to keep themselves safe from homes, fire and disaster. Αναρτήθηκε από geop στις 12:29 μ.μ.